I'm a 'Special K' person too Nic! I love the stuff. 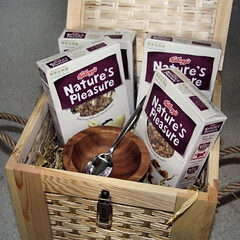 My favourite is Coco Pops but winning a big box of something healthier probably wouldn't be a bad thing! my boys love their special k... i don't drink milk, so i am more of a granola kind of gal, i sprinkle it over my fruit salad. mmmh! Warn oatmeal keeps me going through the day! i'm not in the UK but i'll say anyway! hands down, no doubt about it, quaker's cruesli with dried kiwis, cranberries, and apples from france. huge huge huge crunchy granola clusters with tangy dried kiwi. i can't get it in the states, and i miss it oh so much. before that, it was honey bunches of oats. that lasted a good 6 or so years before I discovered the cereal in france. Great giveaway! My favorite breakfast cereal is a combination of Shredded Squares, Peanutbutter Bumpers, and Kashi Honey Puffs!! I love porridge with a dollop of yogurt on the top! ALL about the weetabix. ALL about the weetabix. With hot milk and sugar. Why, yes, I *have* had the same thing for breakfast nearly every morning since I was three. Booooo! To the all about weetabix person! Bland and tasteless unless you coat it in sugar and then it's more sugary than a mars bar in milk. All about the Crunchy Nut, all about the Crunchy Nut! Addicted to Shreddies, I don't buy them often as I can polish off a whole box in an embarrassingly short time. I mostly eat porridge or muesli. So hard to choose a favourite but love Marks and Spencer triple chocolate crunch for an everyday treat or slightly healthier all bran mixed with special k ! I'm not in the UK, but had to say what a great variety of museli you've got there. Wish we had it here. I haven't seen it anywhere! 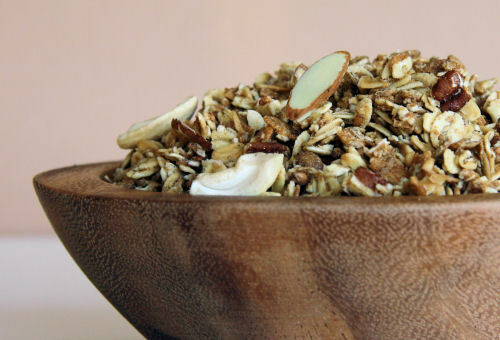 I have a few I love but home-made granola tops the lot! When I was pregnant with my son one of my cravings was big bowls of coco pops, gosh I'm not surprised he didn't come out looking like a coco pop..hahaha! This is the first I have seen of this Muesli, but I am excited already as I am a total Muesli fiend (I had to place a self imposed ban on myself from buying Tesco's Muesli). Crunchy Nut. So nutty and so honey sweet. Yum. Shreddies are the best and even better with a topping of weetos yum! Thank you so much for all the comments, it's lovely to see so many new faces! Shame I missed it. 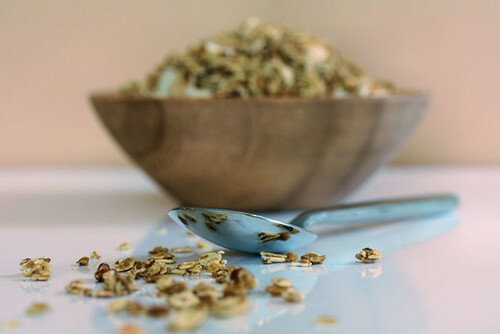 I love muesli.